The Jaguar I Pace invoice price and the true dealer cost are not the same. Note: The Jaguar I Pace pricing report below does not include rebates or incentives. 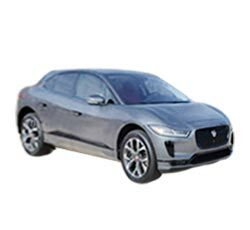 View Jaguar Rebates and Incentives. Nobody expected it, but it turns out Jaguar is the next major contender for the luxury electric vehicle market, thanks to its 2019 Jaguar I-PACE. It should prove to be an exciting pick for an electric vehicle with its offerings: 240 miles of range, an engaging drive, and an enticing aesthetic. Four adults can comfortably sit inside the I-PACE, but the size doesn't hinder the ride at all. Underneath the hood of the vehicle is a 90-kWh battery pack that powers a pair of motors. One motor focuses on the rear wheels, and the other drives the front wheels. Together, they can produce 394 horses, allowing the 2019 Jaguar I-PACE to reach 60 miles per hour in only 4.5 seconds. It takes under 13 hours to fully charge the I-PACE on a 240-volt charger, though you can charge up to 190 miles, or 80 percent, in 10. With a DC fast charger, that 80 percent fill time drops down to just one hour. Even though it fetches a price similar to its main competitors, the 2019 Jaguar I-PACE has smaller dimensions, has only a single-battery setup, and doesn't come with the Supercharger network. It uses standard rear doors, though, instead of a gimmicky structure. The 2019 Jaguar I-PACE is the first of its line, marking the automaker's debut into the luxury electric vehicle segment. Capable of seating five, the 2019 Jaguar I-PACE is a luxury electric sedan. In terms of seat number, battery, and motor, there are no differences between each trim. That means the one that works best for you depends on what features you're looking for. Having said that, the HSE has features that would come standard on any kind of luxury model. Plus, it comes with added creature comforts and safety bonuses. There's a decent amount of equipment at the base level, but the more exciting upgrades happen at the SE level. That said, you'll likely find the happiest balance at the HSE level, where you'll find much more safety, comfort, and prestige. This is the only year you can get a First Edition trim, too, which is basically an upgraded HSE. In all cases, you two dual electric motors powered by a 90-kWh battery pack. Together, this setup produces 394 horses and 512 pound-feet of torque. The S trim sits on 18-inch wheels and provides heated side mirrors, LED tail- and headlights, an air suspension you can adjust, a steering wheel wrapped in leather, and a panoramic sunroof. The liftgate is manual, but the rearview mirror automatically dims as needed. Also, there's dual-zone climate control. As far as technology goes, there's a 10-inch center display, a 380-watt stereo, and a triple digital display setup. Parking sensors and low-speed mitigation provide great safety bonuses, and there are also two tools to help navigate wet roads. Heading up to the SE gets you two inches on the wheels, leather upholstery in the cabin, and upgraded LED lights with automatic high-beam assist. You get the safety features from the S trim as well along with adaptive cruise control and high-speed collision mitigation. Also, you get a power liftgate. The HSE also has 20-inch wheels but with a different style, and the liftgate gets even easier to use; here, you can swing your foot beneath the rear bumper to automatically trigger it. The cabin receives better leather, the stereo system is better, and you get a top-view camera to make it easier to park. As mentioned above, the First Edition is like a more robust HSE. It comes with its own exclusive 20-inch wheels and the Adaptive Surface Response system. This system adjusts the vehicle traction in response to the quality of the road it's driving on. The I-PACE'S packages generally consist of improved cabin materials and more creature comforts. Nearly all safety features that don't come standard on the lower trims can be added. The I-PACE is an engaging ride between its active steering and rapid power delivery. Regulating the accelerator is enough for most driving with the braking set to its most aggressive mode. It's easily one of the fastest of its segment, though not quite the leader. Inside, the I-PACE makes an excellent ride even with 22-inch wheels, though the 20-inchers are better. Under strenuous use, the electric motors whir audibly, but they're quiet otherwise. The seats have a wide range of adjustment options as well as heating and ventilation. There's plenty of room for adult passengers, even for taller passengers. The three-display setup takes some getting used to, and part of that is because it's a little slow. Also, the rear window is a bit small, which hinders some visibility while driving. Although there's hardly any room in the front trunk, the capacity overall is comparable to other compact luxury SUVs. Jaguar designed the climate controls with float in mind, allowing some room for more storage. Speaking of the technology, the display setup is a gorgeous but sluggish affair. You can't use your smartphone on them yet, but Jaguar says they'll add this feature in the future. Example: Base Jaguar I Pace invoice price + the dealer Invoice price of options + destination - Holdback = Total Dealer Cost. Note: All Jaguar I Pace MSRP, invoice and dealer cost dollar figures above are approximate amounts. Prices are subject to change without notice.